In this case study, we look at the story of a client who contacted us after purchasing an old building society building and how we were able to help them. When our client first contacted us at Thornhill, they were in the position where they had just purchased a building that was a building society beforehand. Due to the nature of banks, the building had a strong room installed as well as a night safe that had been left behind. This isn’t an uncommon occurrence as, for the banks, it can be costly to get these removed before selling the building. Commonly for a business of high-value products, like banks, jewellers and art galleries, a strong room is a vital piece of kit. A strong room and/or strong room door will offer an extremely high level of security for the storage of high-value assets. Much more secure than simply keeping it under lock and key. As well as a strong room, this building also had a night safe which, in this case, was a ‘drop safe’, so that customers could deposit money after banking hours via the night safe trap on the outside of the building. The drop safe was encased in concrete in the basement. When the new owners contacted us, we explained all the options that were possible. In some scenarios, the strong room door can simply be removed, and the room can still be used, whereas, in other scenarios, the owners may opt to remove the strong room door and frame or if a demountable vault, the entire vault. These new owners wanted to repurpose the basement but the strong room door and frame and night safe were obstructive to this, therefore, they opted to remove everything. 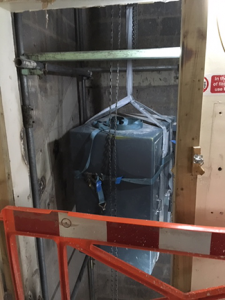 After our initial conversation, our security experts arrived on-site to carry out a survey and provide the new owners with a quotation for the removal of the strong room and night safe. 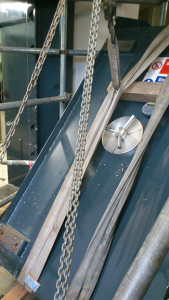 Following the acceptance of the quote, Thornhill erected a tower at the premises and used a chain block to raise both the strong room door and frame and the night safe out. Both were loaded onto a lorry and taken away, leaving the customers to enjoy their new empty basement. 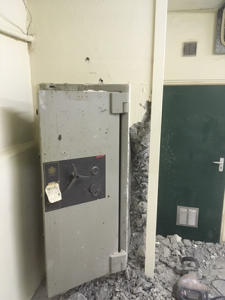 At Thornhill Security, demountable vault and strongroom door removal is one of our principal services. 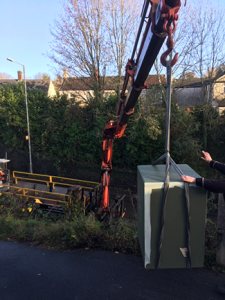 With a team of security experts, removal teams and fleet of lorries equipped with cranes, you only need to deal with one contractor throughout the whole process; saving you time and money. If you have a vault, strong room door or large safe that you need removing or relocating, call one of our expert team today on 0117 967 4994.